Each year, approximately 3,000 of the best high school musicians in the state audition for the Nebraska All-State Band, Chorus, Jazz Band and Orchestra which are sponsored by the Nebraska Music Education Association. Selection as a member of one of these groups is one of the highest music honors attainable in Nebraska. 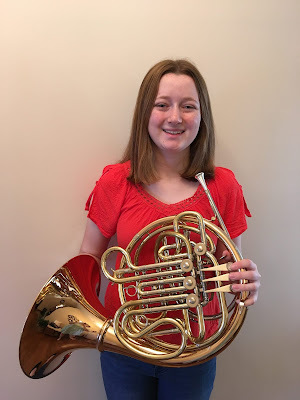 Mr. Ryan Placek, Director of Band Affairs for the Nebraska Music Education Association, is pleased to announce that Exeter-Milligan Junior, Caitlin Murphy (French Horn), will be among the 160 students selected to be a part of the 2018 All-State Band. Guest conductor for the group will be Patrick Sheridan, one of the most celebrated tuba soloists in his instrument’s history and performer in more than 3,000 concerts in over 50 countries in venues ranging from the White House to NBA half-time shows to the Hollywood Bowl. The All-State Band will rehearse Wednesday, November 14th through Friday, November 16th on the University of Nebraska-Lincoln campus, the host site of the 2018 NMEA Conference/ Clinic. A final public concert will be held on Friday, November 16th at the Lied Center for the Performing Arts on the University of Nebraska-Lincoln campus.